Double braided headband! Two 3/8 inch braids attached to a plastic headband for ease of styling. See item details for available colors. The perfect accessory to add pizazz to your hairstyle! This chic, 3/4 inch thick braid has an elastic band at the back, so it adjusts comfortably to the size of your head. The hair is made from the finest modacrylic, kanekalon fiber. See item details for available colors. Keep your wig in place, while styling it on your head! 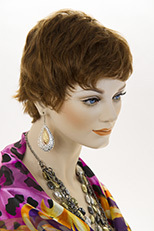 The chin strap holds and secures the wig on your head, freeing up your hands for styling. One size fits all. Be creative! Long straight clip in hairpiece, which is 16 inches in length. Secures easily with a toupee clip onto your own hair. Perfect for adding highlights or accents of color, where ever you like. See item details for available colors. Color Ring Hair Samples By Product Line. 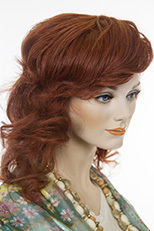 Color ring is a must for anyone purchasing wigs or hairpieces online. Please, understand that the color chart should only be used as a guideline! It is not an accurate representation of the true colors, due to variations of each individual computer monitor, different lighting effects and individual perceptions. 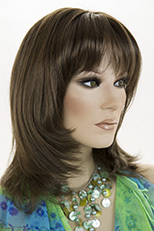 When purchasing wigs online it is recommended to rely on the color numbers and descriptions not on the pictures. We sell color rings for this purpose. False eyelashes available in black or brown. Toupee Hairpiece tape Use toupee tape to adhere the toupee onto your scalp. It is double-sided tape that sticks to your scalp on one side and the toupee on the other side. Having a canvas block head is a must, for anyone who is serious about styling their wigs! Secure the block head with the wig clamp to a comfortable work table. 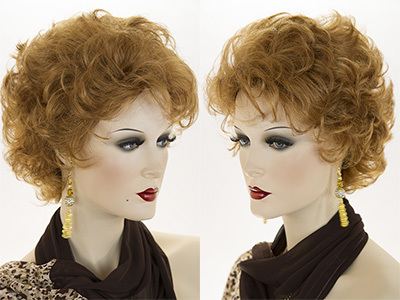 Place the wig on the head, secure with T-pins and style with ease. The circumference is approximately 24 inches. This pro wig clamp is a must for anyone who is serious about styling their wigs! 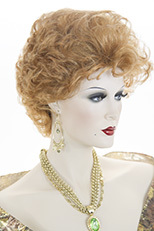 It secures the canvas block head to your work table so that you may style your wig. The perfect place to display or store your lovely wig! 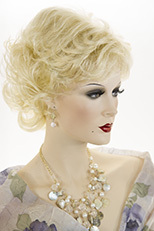 This lovely mannequin is decorative and functional. It's always a good idea to let your wig air-out after wearing it all day.